Load into a mission. Any mission really. If you’re brand new and would like some help on this, continue with STEP 2, otherwise proceed to STEP 3. 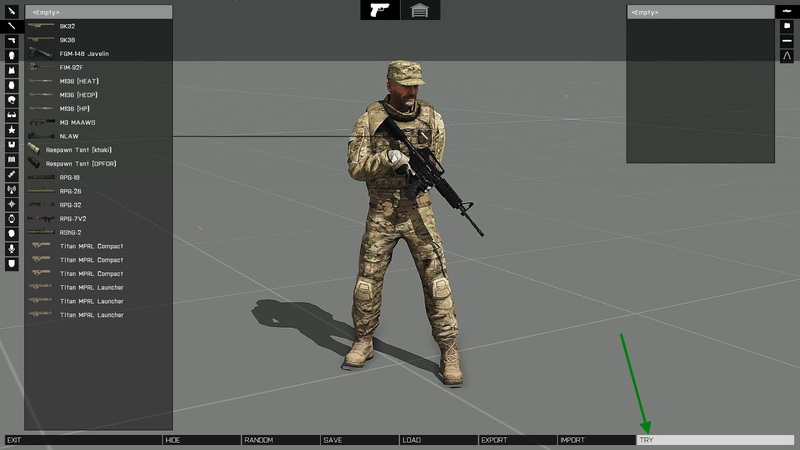 From the Main Menu, select the LEARN Option, followed by Virtual Arsenal. Once you’ve loaded into Virtual Arsenal, click TRY in the lower right. This will launch you into the game world, which is what we need to do to access the ACE keybinds. Hit ESC to pull up the escape menu in game. 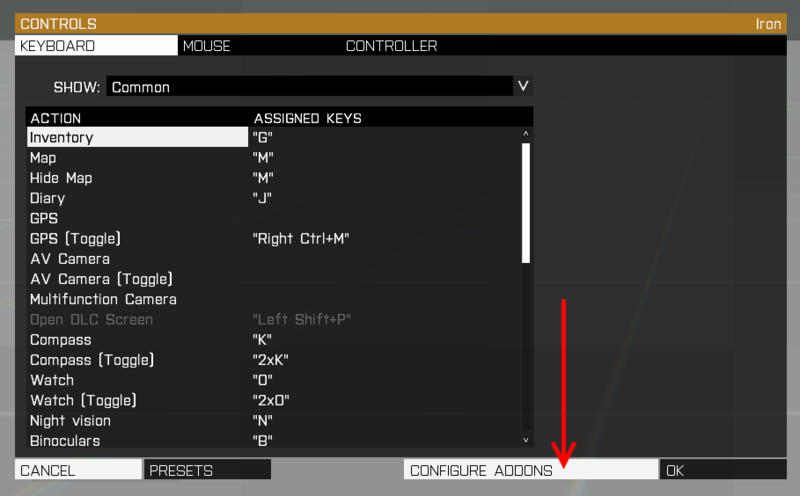 Click CONFIGURE and then CONTROLS. 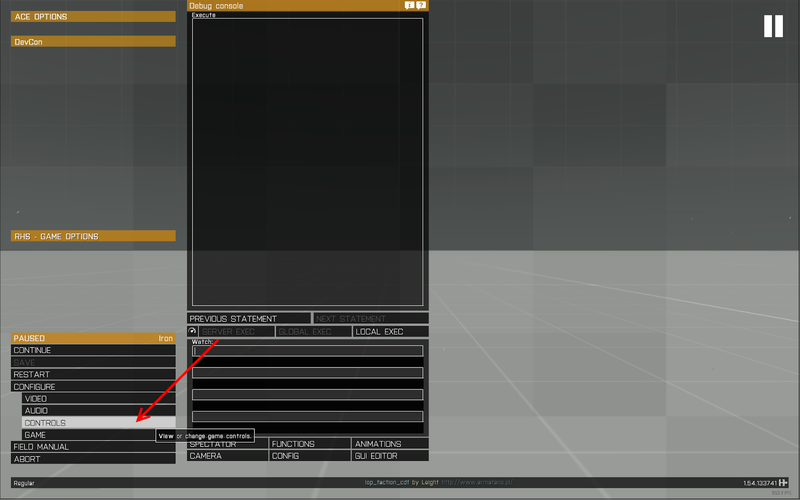 At the bottom of the dialog box is a key for CONFIGURE ADDONS. This takes you to a new dialog box. 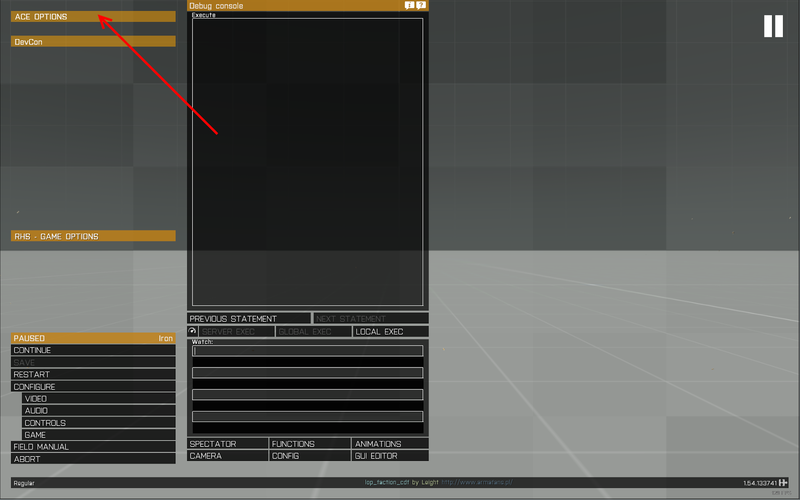 From the new dialog box, select ACE3 Common from the dropdown box. Make sure that you are able to use the ACE INTERACTION and ACE SELF-INTERACTION keys. 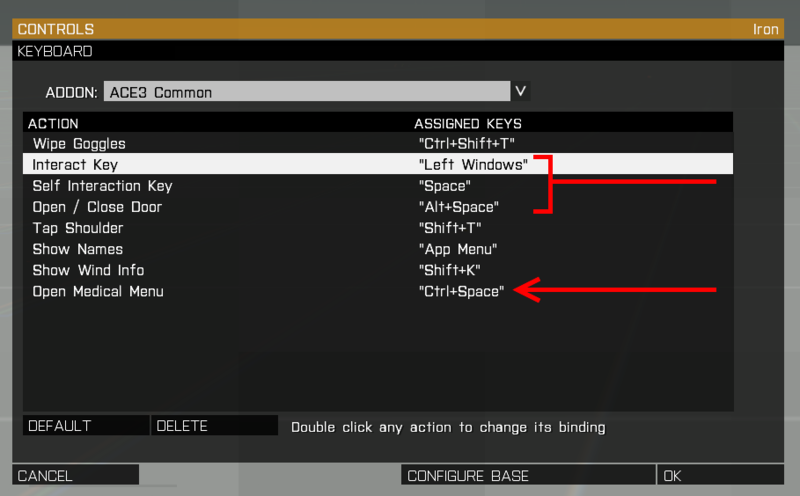 They default to Left Windows and CTRL+Left Windows respectively. 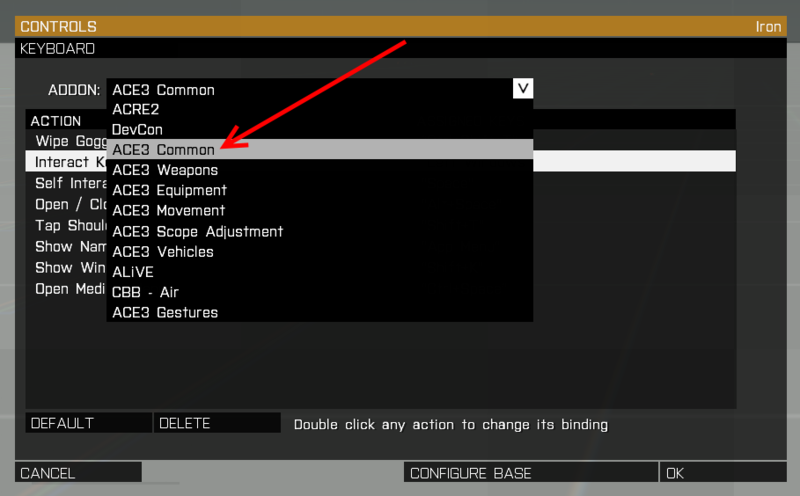 These are both very commonly used keys in the ACE system, so make sure they are something you’ll be able to use easily. We strongly recommend Left Windows for INTERACTION, and Spacebar for SELF-INTERACTION. We also recommend setting OPEN MEDICAL MENU to Ctrl+Spacebar. As a side effect of this you’ll need to remap OPEN/CLOSE DOOR to something less convenient, but this trade is worth making. 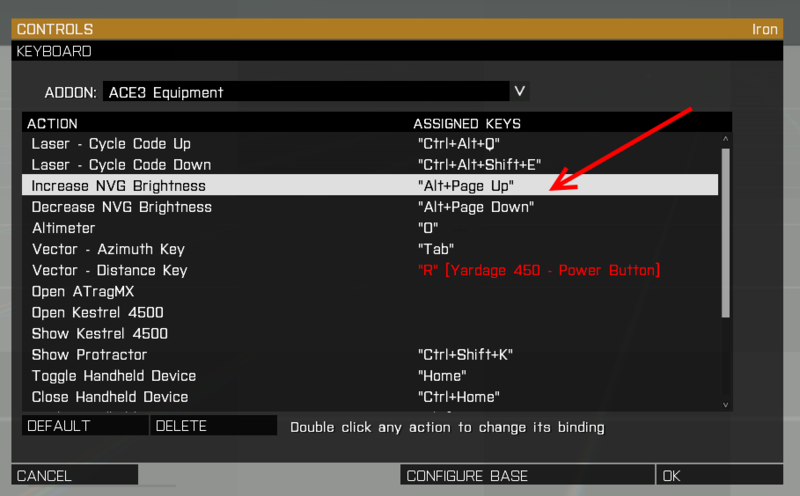 Select ACE3 Equipment from the dropdown box and verify that you are able to use the NVG Brightness keys, or change them as you see fit. They default to ALT+Page Up and ALT+Page Down and are used commonly. Select ACRE2 in the Addon dropdown. 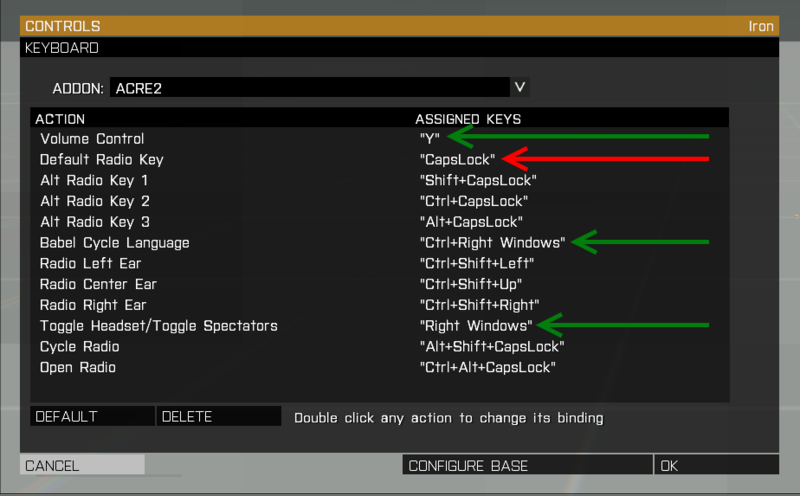 Make sure your “Default Radio Key” is easy to press and a different key from your regular Teamspeak Push-To-Talk. The default CapsLock here works very well. You will also want to make sure nothing is bound to Left Windows. Previous versions of ACRE would attempt to put “Toggle Head/Toggle Spectators” or “Babel Cycle Language” on Left Windows, so watch out for those. Finally, move “Volume Control” off of the default Tab key to something out of the way. It is something you’ll need to have bound, but it is not something you need to hit frequently or rapidly, and other things expect the Tab key to be available. That’s it for mod keys that you’re likely to care about right away, though there are dozens of other interesting and potentially useful ones. We encourage you to browse through the list to get an idea of what ACE can do. 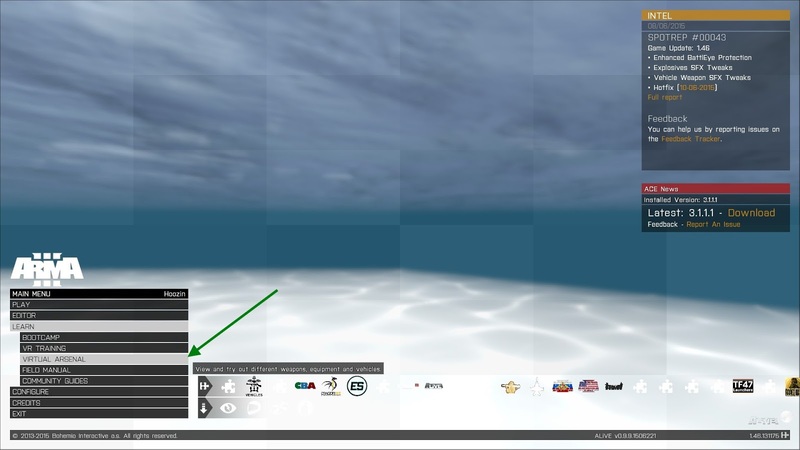 On the main menu, click the ACE OPTIONS button in the upper left hand corner. 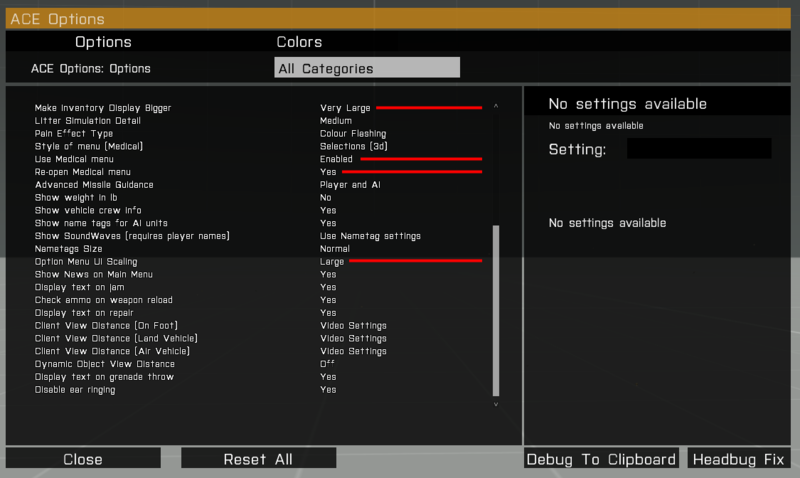 The following are two images show one player’s preferred settings. Marked in red are those settings we strongly recommend you check and set to the values shown. 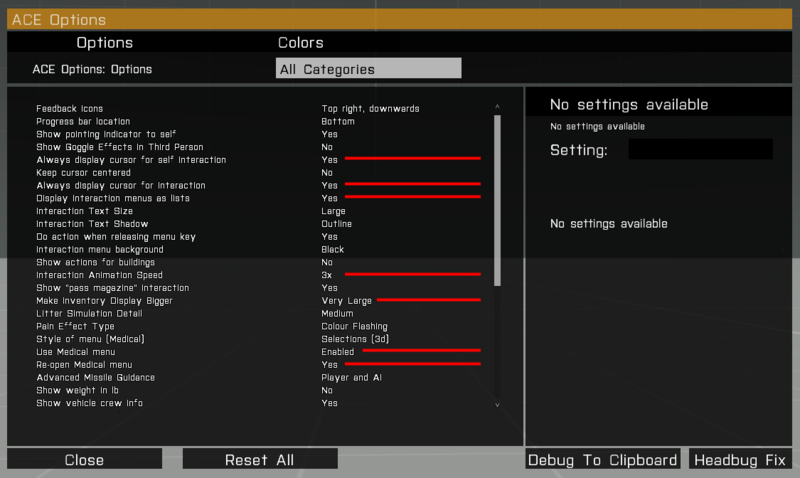 Note that ACE supports many languages so your options menu may differ slightly in appearance. These are all highly configurable and modular, and we encourage you explore the rest and play with them to find what settings you like best. That’s it! You’re done and ready to manshoot with Clear Backblast! Don’t forget to join our Discord channel and introduce yourself. Our Discord is the most important and active communication tool we have, so please check it out!